The Religious Studies Department has been judged good with many outstanding features based on the department review of 2017/8. Miss Bishop is the subject leader for Religious Studies and the department is made up of three teachers who are all passionate and have an extensive knowledge of their subject. The team are very proud of their department and students and staff enjoy their lessons and are motivated to succeed. The SMSC agenda is covered and students are encouraged to ask questions and develop their curiosity in a wide range of religious and philosophical areas. The extensive sharing of good practice, a desire to remain on top of current affairs and maintain up-to-date subject knowledge as well as an excellent work ethic and the drive of the Religious Studies team are some of the many reasons this department performs so well. There is a particular focus on ensuring the most able students are appropriately stretched and the team enjoy developing creative resources and lesson plans that support all students' learning. Literacy is incorporated into lesson planning and work is marked for literacy as well as for subject-specific content. Students are encouraged to use structured writing frames to ensure they achieve full marks in the extended response questions at GCSE and A Level. This assists in developing their essay-skills in general which in turn supports them with their final exams. Throughout years 7 and 8, students study the six major world religions as well as topics such as philosophy and genetic engineering. 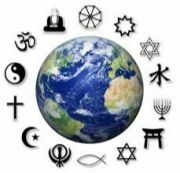 Students are able to choose Philosophy, Religion and Ethics for GCSE where they study two religions: Christianity and Buddhism as well as ethical beliefs that are applied to world-wide events such as crime and punishment and medical ethics. GCSE: The GCSE results were exceptional in 2018 with 97% of students achieving grades 9 - 4 and 57% of students achieving grades 9 - 7. A Level: The A Level results in 2018 were excellent with 100% of students achieving grades A - D.
Students at all key stages enjoy their Religious Studies lessons. They particularly enjoy the open discussions, question and answer sessions and interesting video clips that are incorporated into lessons as well as learning about different views to their own. Students appreciate the uniqueness of the subject in exposing them to a huge range of philosophical positions on complex topics relating to what it means to be human, belief in divine powers and challenging moral and ethical dilemmas. At all Key Stages, students commented on the amount of quality feedback they recieve from their teachers and, in particular in KS4, that the structure and preparation for exams is excellent. A Philosophy Club has been set up for students in Years 8, 9 and 10. Here the students discuss and explore ethical and philosophical topics in order to stretch and challenge their imagination and debating skills as well as broadening their minds to become more inquisitive and reflective individuals. Students in Years 10 and 11 are invited to attend “Philosophy Phocus” where they work on their exam skills, improve their use of quotations and talk about ethics and any other ideas from lessons. At KS5, where there is a much smaller cohort, a more individualised intervention and support programme is in place. Students’ work is tracked, with additional intervention put into place where weaknesses are identified. Examination technique with reference to the 12 mark questions is a particular focus and these skills and techniques start to be introduced in KS3 assessments in order to develop key skills which will support students at GCSE and A Level. The department run a number of trips, including a Year 10 visit to Southwark Cathedral to explore Christian practice as well as to discuss current affairs and ethical topics with a member of the Clergy. Year 13 students are offerred a trip to Rome to explore Catholicism and its role in shaping Italian culture and philosophy. This is a fantastic cultural opportunity that students thoroughly enjoy. A number of A level students went on to study humanities subjects where their knowledge and skill base from A Level Religious Studies and Philosopy is of great use. One student went on to study for a degree in Human Rights whilst others have gone on to follow Islamic Studies and Philosophy courses and Medicine at university. Continued focus on ensuring that the new A Level and GCSE schemes of work are developed to meet the demands of the new exam specifications as well as to prepare students to sit their exams. This includes a key focus on exam technique. To develop the new marking and feedback policy to ensure that students are given structured fedback which provides them with clear, precise comments for how they can directly improve their work and progress further. To continuously develop Religious Studies lessons, homework and interventions to support students of all abilities. To ensure that all students make excellent progress in Religious Studies.